Cook’s note: this is a great way to re-imagine that same old pumpkin when it seems to be coming out of your ears. You can use any sweet winter squash, so don’t be afraid of that weird french variety you’ve never heard of before–they’ll all work pretty much the same, and heirloom vegetables support crop diversity! Roasting the squash adds a significant amount of cooking time to the process, but you don’t have to watch it carefully; in fact, roasting is one of the least labor-intensive methods for cooking squash! You can add garlic, ginger or coriander to vary the flavors. Preheat the oven to 350°F. Cut the pumpkin in half and rub with oil or butter. Place the halves flesh-side down on a cookie sheet and roast for 45-60 min until fork-tender. Let cool. Remove and save the seeds from the pumpkin, then scoop out the flesh. Heat 1 Tbsp oil in a pot on medium high heat, then add the diced onion and brown for 3-5 minutes. Add spices and stir for another minute. Add the stock and pumpkin and bring to a boil. 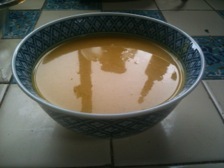 After 15 minutes or so, turn off the heat, let cool and blend soup in a blender or food processor until smooth. Pour back in pot and bring to a simmer, then add the coconut milk. For an extra kick, toss the pumpkin seeds in another tablespoon of oil,1 tsp curry powder and 1/2 tsp cayenne. Toast seeds in the oven at 350°F for 15-20 minutes and use as a garnish. Variations: add cooked quinoa for a heartier dish or kale to add color and texture to the meal.